In honor of the last volume of the Wheel of Time series by Robert Jordan, I'm giving away either a free copy of the first book or the last. What better way to celebrate and mark the last day of the year than a contest? One lucky winner can choose to either a new copy of The Eye of the World or A Memory of Light. "The Wheel of Time turns, and ages come and pass, leaving memories that become legend. Legends fade to myth, and even myth is long forgotten when the Age that gave it birth comes again. In one Age, called the third age by some, an Age yet to come, an age long pass, a wind rose in the Mountains of Mist. The wind was not the beginning. There are neither beginnings or endings to the turning of the Wheel of Time. But it was a beginning." Epic fantasy is my favorite genre of fantasy, and I'm hoping to add a few more fans to these fabulous set of fourteen books. It's a series I've been following since 1990 when I unwittingly bought the first edition of what would become my favorite series of all time. 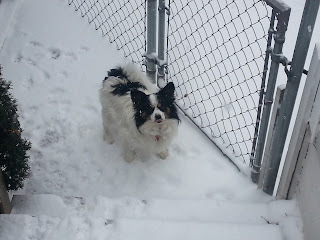 Now the last book, A Memory of Light, releases on January 8 and I'm jumping in my winter snow boots with anticipation. So it has been epic, not only in genre, but in timeline, over twenty-three years, two authors, and countless days waiting for the next installment. All that is about to end. To enter just fill out the doohickey down below and leave a comment on this post. You can follow me on twitter, facebook, and this blog for additional chances to win. So tell your friends and come back on January 8th for the winner announcement. to spit in Sightblinder’s eye on the last Day." 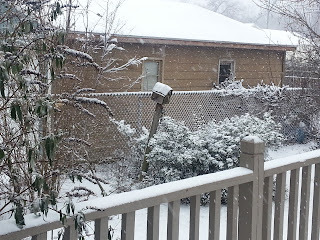 I promised snow pictures for my friends in those warm climates who never see any of the white stuff. 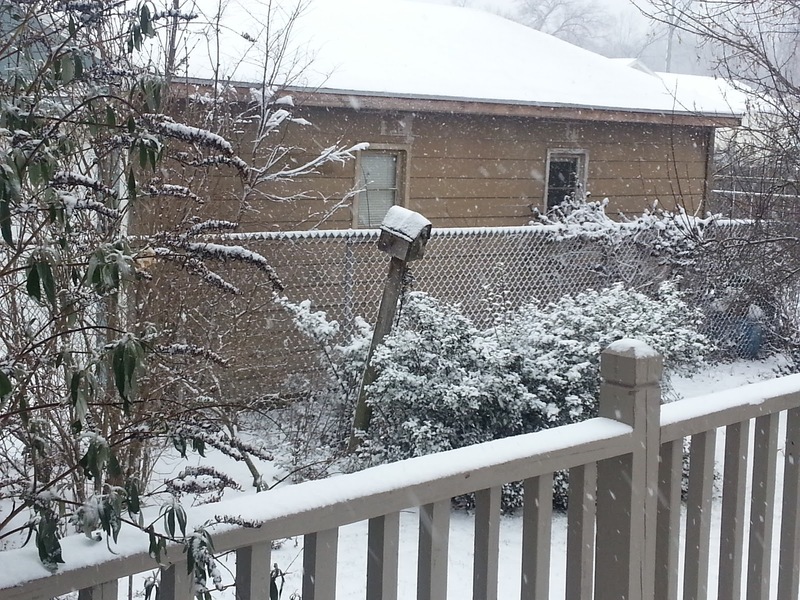 (Grumbles under breath about lucky SOB's in warmer climates. You know who you are!) 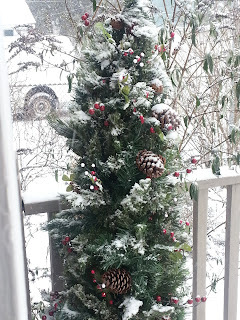 We got our first snow fall on Boxing Day, not that we celebrate Boxing Day, but it's such a cool name. 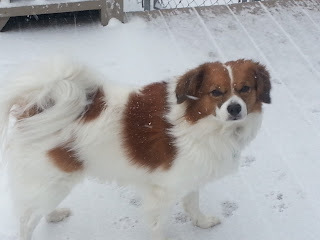 It was only a small amount of snow for us in Northern Indiana, about three inches. I'm sure we will get plenty more. So if anyone wants more pictures, shout out in the comments. I could mail you a few boxes of it, but they'd be soggy. 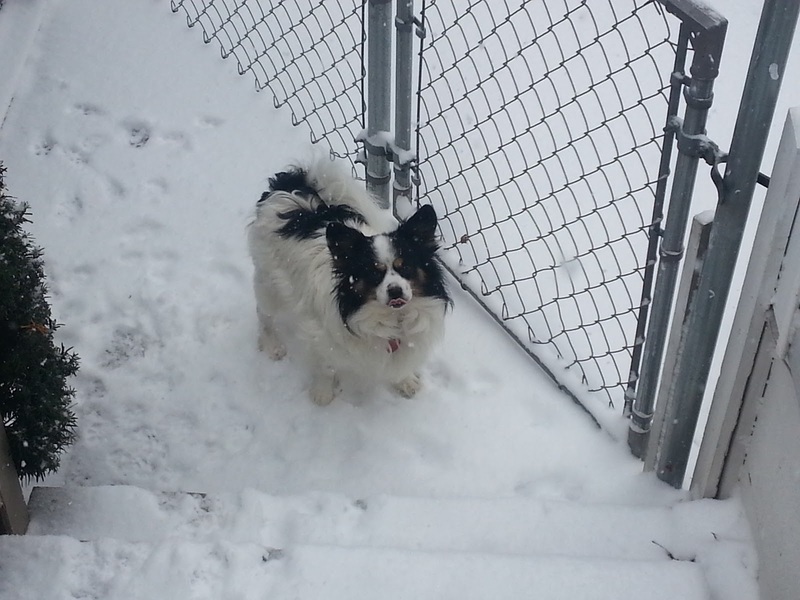 Here are some equal time pictures for my two dogs. The brown one is Robin--not named for the superhero, but for the bow and arrow guy. He doesn't like the wind. The black one is Pippin--yes named for LOTR's Pippin. And he is a pretty princess who doesn't like to get his feet wet. He also wouldn't look at me until I took twenty pictures. My fingers were freezing. You might be able to see Pippin is sticking his tongue out at me. I did get to see the Hobbit movie. I liked it a lot, but I didn't love it. It seemed like they stretched the material a bit. Three hours is pretty long even for LOTR. We went the Saturday after the tragedy in Connecticut so that might have been on my mind also. I will definitely see it again and maybe it will strike me more favorably. In other news, I'll be starting the contest to win a copy of a Wheel of Time book this weekend, either the Eye of the World or A Memory of Light. I'll let the winner pick which one they want and whether an ebook or a paper version. Not sure whether the post will go up on Saturday or Sunday because my motivation is as uncertain as the weather. So stay tuned for that. Oh, and Kindar's Cure is now on Goodreads in anticipation of a March 2013 release. I'll probably do another announcement about that. 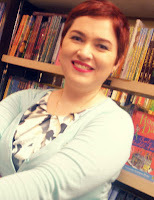 You can friend me here or add Kindar to your 'to be read' list here. My editor is healing up after some surgery so there hasn't been much movement by the publisher. I wish her well and healthy and back to work soon. I wouldn't be surprised if the release date gets pushed back a little bit which give me more time to prepare. I'm really glad to come back from my short blogging break in a big way. I've always wondered what it would be like to be on submission and I'm sure others have too. Here's your chance for an inside look. Thanks so much, Stephanie, for sharing. You bet I've added EXTRACTION to my Goodread's lists. A couple weeks ago, I had the opportunity to attend an author event in San Diego called “YA in the Sun.” I met some wonderful writers, both published and unpublished. A common question people asked me that day was: What are you? Reader or writer? My response was: I'm an agented writer on submission. I received lots of (sarcastic) replies of: OH MAN, fun times. And: ugh. IF EDITORS LIKED MY BOOK, THEY WOULD'VE READ IT AND REPLIED IMMEDIATELY. NO ONE IS EVER GOING TO OFFER. I AM NEVER, EVER, EVER GOING TO BE PUBLISHED. 1. They have to like the pitch enough to read the manuscript. 2. They have to fall in love with said manuscript (and believe that people will buy it). 3. Other people in their office have to read it and fall in love with it (and believe that people will buy it). 4. The entire team has to put forth an actual offer. At any point along the way, that “interest” could turn into absolutely nothing. So, that day at YA in the Sun, I wasn't bouncing on my feet. I was terrified. And I remained terrified for the next two weeks, until on the lovely morning of Tuesday, November 19, I received an email from my agent (because the phones were out of commission in her office) that we had an ACTUAL OFFER from St. Martin's, an imprint of Macmillan. An offer for a three-book deal, which meant I'd be able to write the sequels I'd been dying to write. I was literally about to walk out the door to drive to school when I received the email. I didn't want to be late for class, so I quickly responded with something like AHHHH and arranged with Alison to call her as soon as I got to campus. The thirty-minute car ride consisted of me smiling giddily and singing loudly. I got to school, called Alison, and we talked the offer over. When I hung up with her, I called my mom right away. Then I had to attend college classes and pretend like everything was normal. I didn't tell anyone about the offer that day except for my parents because I was afraid of jinxing everything. The next day, we accepted the offer, and I spilled the news to some of my closer friends and critique partners. I couldn't concentrate on anything else for the next couple days. I basically died of happiness when Publisher's Marketplace announced the deal. I've wanted to be a published author since I was seven. Not just like, “Oh, hey, it might be cool to get published someday,” but more like, “THIS IS MY GREATEST DREAM.” I sent out my first query letter at thirteen. It took me six whole years and hundreds of query letters before I signed with an agent. Yes, I know nineteen was a pretty young age for that, but six years is still a long time. And it was really more like twelve. In a little less than two years (assuming all goes well in editorial land *crosses fingers*), my novel EXTRACTION will be on shelves. I'm not sure I've ever been more excited for anything, or more terrified. People will actually be able to READ it and carry it with them in their purses and spill food on it and tell their friends about it. Maybe they won't pick it up. Or maybe they'll read it and hate it. But you know, even if one person reads it and loves it, that will make me smile. EXTRACTION is a story that fell into my head one night when I wondered what life would be like if the moon were poisonous. I wanted it to be something thought-provoking and possibly heart-wrenching, and I hope I've accomplished that. I hope you'll give it a chance. Of course, I have to finish making it shiny first. I should really stop writing this guest post, as it is allowing me to procrastinate. In light of the recent tragedy in Newtown, I don't really feel like chatting about movies or holding contests so I will be taking a blog break until later next week. Please enjoy your holidays with family and friends and keep the people of Newtown in your prayers. I am reminded how fortunate I am every time I go to work and see twenty shining first grade faces that are safe and healthy. Don't forget to thank the teachers in your life. They do their jobs out of love. The Memory of Light contest will start a week later than planned. I have a pitch for Dodge the Sun up at KTCrowley's blog as part of the Baker's Dozen Non-Chosen Entrants. It is number 37. If it should happen to snow before Christmas, I plan to share some pictures for friends in warmer climates. Just dropping a line to say I can't wait to see the Hobbit! Only one problem: schedules. Suddenly everyone wants to have a family party--just a few hours drive away. My son started a job at his high school and may or may not have to work. Since he can't drive yet, this falls on guess who. Daughter is still getting over the cold she caught from (oops) me. This on top of Christmas baking, shopping and merry making. I see my Hobbit chances this weekend sliding into oblivion. Ugh. Me: *Lifts chin* Will find time. Will slap the schedules around until I find a window. Gandalf schedule wizard: You shall not pass. Me: Move over obligations. I'm being selfish this time. Gandalf schedule wizard: The darkness is deepening. Me: Don't bet on it, bub. I wish none of this had ever happened. Gandalf schedule wizard: So do all who live to see such times, but that is not for them to decide. All we have to decide is what to do with the time that is given to us. It's no secret that I love epic fantasy. I read it and write it. One of the greatest epic fantasy series of all time and a favorite of mine is coming to a close. January 8, 2013 is the release date for Memory of Light, the last of a fourteen volume series. Yep, that's right. Fourteen volumes over thirteen years of the Wheel of Time. (Or WOT to its admirers.) Thirteen years of dedication to one set of characters. An incredibly intricate mass of world building that encompasses dozens of invented countries and cultures. And what impresses me the most is the individuality of the huge cast of characters. This series has a tragic history. 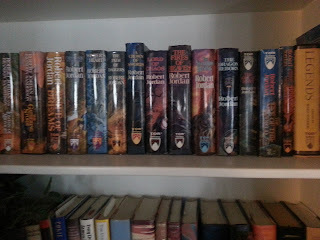 The author, Robert Jordan, died after the eleventh book, Knife of Dreams, was finished. Knowing he had a short time to live, he wrote detailed plans and dictated notes, included whole pieces of future novels and most of the grand ending. His editor and wife Harriot help hand pick Brandon Sanderson to finish the series. The last three books are coauthored by Sanderson, using Robert Jordan's notes. In my opinion, Sanderson has done a pretty close job of matching the style and tone of Jordan. It takes an entire shelf on my bookcases to hold all the volumes plus, the prequel called New Spring. 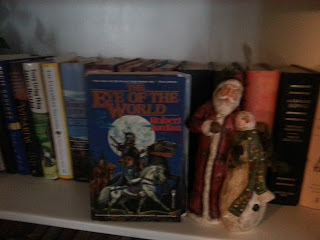 Back in 1990 I bought a book titled, Eye of the World. It was a first edition trade paperback. I had no idea that I'd be hooked for the next decade. Waiting on each new release. Soon I'll have to make room for the very last addition. My favorite aspect of the WOT series are the clues Jordan put everywhere. Using prophecy and dreams, he hid clues to future book in plain sight. I do love trying to unravel events before they happen and WOT is the best around. There's nothing to equal the joy of finding your predictions coming true two books down the line. In honor of this much awaiting book, I've decided to have a contest. I'll be giving away a new copy of either Eye of the World or Memory of Light. (Yep, you won't be getting my ratty old copies, but new ones.) Next weekend, I'll have a sign up for a chance to win. The winner will be announced on January 8th. So what I need from you are comments on which prize you'd like to see. Are you new to the series and you'd rather have a chance at Eye of the World so you can start from the beginning? 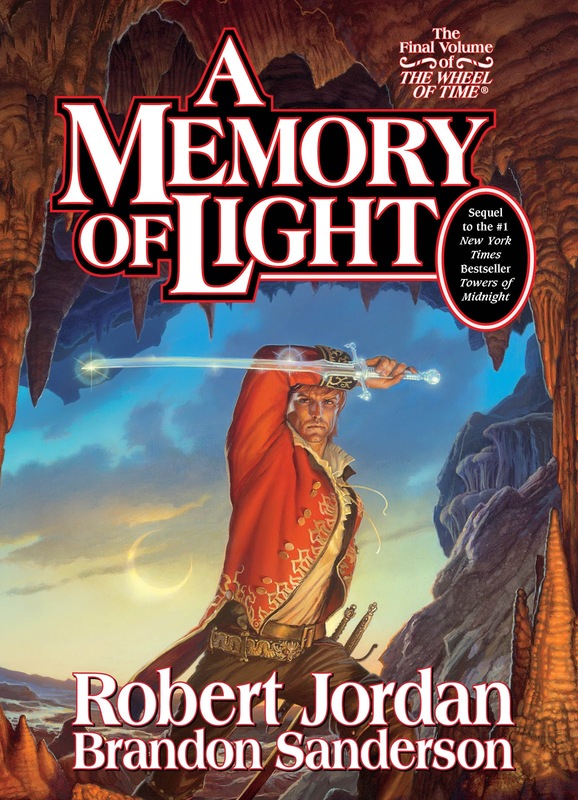 Or are you a longtime reader and want a copy of Memory of Light? Put your answers in the comments and let me know why you love WOT, then come back next weekend for the announcement. I hope you'll help me welcome the new release of a wonderful lady. This book is at the top of my 'to be read' list. From my bookshelf it is daring me to get done with this post and get busy reading. Arianne gave Ben a sidelong glance as they walked on the grass embank­ment running parallel to the road. Weeds tugged at his baggy jeans. The set­ting sun dyed his foul ball t-shirt orange. He’d picked up a stick and some pebbles and played “pitch and hit.” The bill of his Braves baseball cap smiled upside down over his boy-next-door face. Every properly timed whack plucked at Arianne’s nerves. The whole day she’d imagined how her conversation with Ben would go. One scenario ended with her running away in tears. Another involved Ben never speaking to her again. And in the last one, her personal favorite, an asteroid would end the world before she could confess everything. “Did you change your hair?” he asked after his third imaginary homerun. 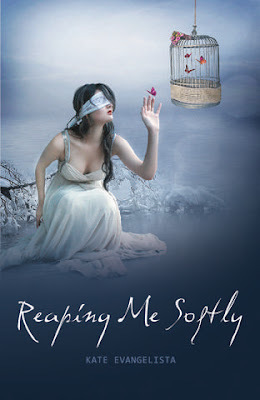 Arianne jumped at the sound of his voice. She considered what Ben said. Maybe telling him isn’t such a good idea. “Am I really that transparent?” Arianne shuffled her sneakers and adjusted the strap of the bag on her shoulder. “Happy April Fool’s to you, too,” said Ben. Arianne grabbed his sleeve. Ben searched her face, and her gaze fell. An afternoon breeze ruffled the leaves of the trees lining both sides of the road. The sunset stabbed shadow knives all around them. Arianne thought she must have had an aneurism between the time she’d told Ben her secret and when he’d accepted it as nothing special, because it seemed so surreal that all the scenarios she’d played out hadn’t happened. Especially her favorite one. “Thanks,” she said as Ben tugged her toward home. I hope everyone is surviving the shopping season and having a good time with family and friends. I promised a quick post about how the James Bond movies give a great example of a successful and enduring series. Truthfully, I wanted an excuse to post more pictures of Bond. 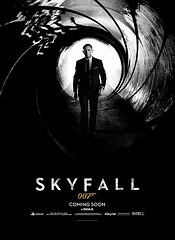 The Bond movies succeed because they form a blend of the familiar with the new. They give us what we love and include something we haven’t seen before. First off, the Bond movies stay true to the cast of characters. They create memorable characters, and they aren’t afraid to reuse them over and over, keeping their personalities intact. 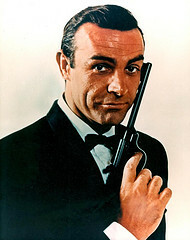 Besides Bond, there are M and Q, Moneypenny and Felix. Those characters are the foundation of the series, and it doesn’t matter whether the actors change as long as the characters remain essentially unchanged. The core plots are always the same as well: A villainous mastermind out to destroy the world, only to be stopped by the physical and mental manipulations of the seasoned spy. Viewers know to expect grand action scenes, culminating in one vast final coupe of explosions and death. 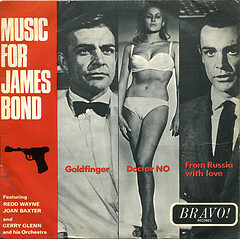 But Bond always blends the known with the new and improved. There are always new gadgets to impress with their technology. New heights to which the action reaches in an unstoppable bid to outduel the last movie. Thought many characters remain the same, we can always count on new and exciting additions. Almost each movie introduces a new villain. There are new beauties to admire and conquer. Obviously there is much to be learned for writers about balancing content from previous works while keeping it all new and fresh. The scope should always be trying to be bigger, more impressive. It’s a can’t lose combination.